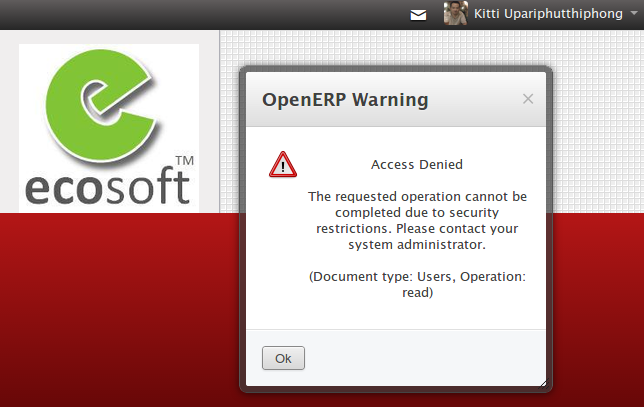 In some case, you may found a weird Access Denied (Document type: Users, Operation: read) after deep system upgrade. While checking the setting for that user, it seem all correct. This is quite a cumber some for me, at least. Following is the cause I found after debugging the system. You can test it whether this is the problem, by try to inactive this rule. If user can log in then, this is it. I found this problem happen, after I upgrade account module. The problem was becuase user records for the company in res_company_users_rel table was deleted. I fix it by adding it back using following SQL.